Discover Le Gard, a beautiful region of Southern France. Discover Le Gard, a beautiful region of Southern France. The varied landscapes, historic cities, stunning beaches and the hot, sunny climate make Le Gard ideal for a luxury camping holiday. Get close to nature while enjoying all the comforts of home: contact LUX-camp to book your camping holiday now. Why is Le Domaine de Gaujac a great choice for your luxury camping holiday? With its fascinating history, Mediterranean coastline, colourful markets and nature reserves, Le Gard offers something for everybody’s taste. The region produces some interesting wines that are the perfect accompaniment to the delicious local cuisine. Le Domaine de Gaujac is a peaceful, quiet luxury camping site that is ideal for a relaxing holiday with family and friends: dogs are also welcomed. Whether you prefer to rent a mobile home or a luxury chalet, you will find that your accommodation will be equipped with all the modern comfort you expect from a luxury camping holiday. Every mobile home and bungalow tent has a kitchen area with sink, hob, fridge and microwave and a private bathroom. Outside you will find a covered deck area and plenty of space where you can sit in the shade of the pine trees - perfect for getting back to nature. 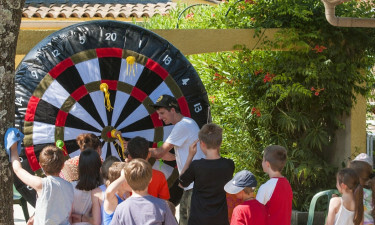 The range of activities offered at Le Domaine de Gaujac ensures that there is something for everyone. There is a heated outdoor pool, as well a water park with slides that children will love. 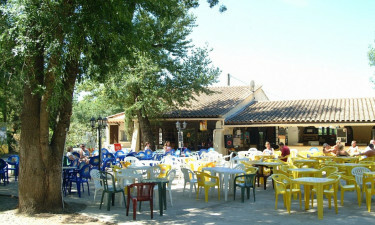 You can also enjoy football, boules, fishing, tennis, table tennis and volleyball. From June through to September there is a children’s club every day from 10.00 to 13.00, offering activities such as dance, karaoke, cinema and games. There is also a programme of evening entertainment for everyone including bingo games, cabaret, quizzes and floodlit boules tournaments. To make your luxury camping even more relaxing, a restaurant and bar serves snacks and meals including favourites such as pizzas, grills and salads. Wednesday evening is theme night! Free Wifi is available on the bar terrace. At this luxury campsite, you will find a mini market where you can stock up with all the basics, such as fresh bread, water, fresh fruit and vegetables, milk and essentials for your barbecues. Le Domaine de Gaujac lies adjacent to the Cevennes National Park and is the starting point for many walking and cycle routes. 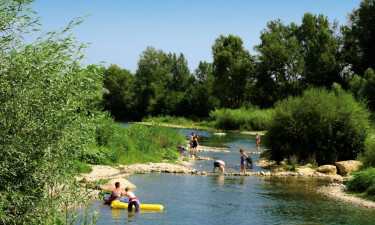 The river Gardon with its islets and sandy beaches flows by the camping site. Should you wish to make excursions further afield, unmissable attractions include the Pont du Gard, a Roman aqueduct, the stunning Gardon river canyons and the Camargue marshes, famous for white horses and feisty black bulls.